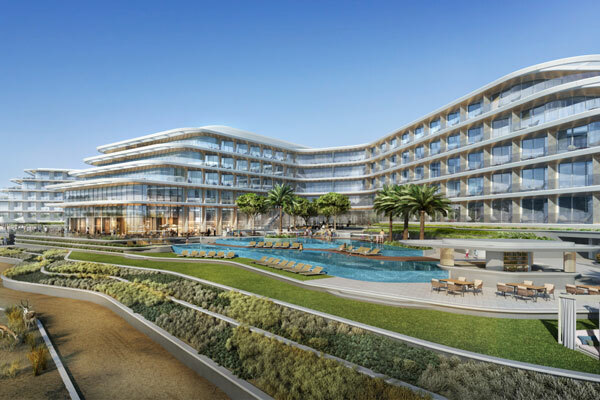 JA Resorts & Hotels' new five-star hotel in Dubai, located within the 128-acre JA The Resort in Jebel Ali, is on track to open in September, the group announced. Located just 10 minutes away from Dubai Parks & Resorts, 20 minutes from Dubai’s buzzing JBR and 30 minutes from the iconic Dubai Mall, the JA Lake View Hotel will open as the third property within the hospitality development, joining the JA Beach Hotel and the all-suite JA Palm Tree Court. The hotel will add another level of unforgettable experiences for modern travellers with discerning taste by offering exciting restaurant concepts driven by chefs with Michelin-star acclaim, three additional outdoor swimming pools and a spectacular contemporary rooftop bar with views over the golf course and Arabian sea. The 348-key hotel is designed to be spacious and relaxing, with a focus on light and space, and a neutral colour palette complementing the natural surrounds of the green landscape and saltwater lake. The property also offers five meeting rooms with floor to ceiling windows and superb views, ideal for forward-thinking companies who wish to bring energy and focus to their meetings and events. In a year where JA Resorts & Hotels has hinted at a new food and beverage focus and multiple exciting new additions, JA Lake View Hotel will launch Kinara, a vibrant Indian restaurant, headed by James Beard Award Nominee and Michelin Star Chef Vikas Khanna - the internationally acclaimed Indian chef. Host of several seasons of MasterChef India and voted as one of the Sexiest Men Alive by People Magazine, Khanna is set to add some culinary flair to the new property. The hotel will also host 81, a buffet restaurant serving breakfast and dinner with live cooking stations, named after the inaugural year of JA Resorts & Hotels first property. Republik is set to be a new modern gastropub with Friday brunches and a live DJ and the rooftop mixology lounge, with panoramic views of the sprawling estate will be named Bibé, after the Latin word for drink.